The equation neatly sums up our current understanding of fundamental particles and forces. It represents mathematically what we call The Standard Model of particle physics. The top line describes the forces: electricity, magnetism and the strong and weak nuclear force. 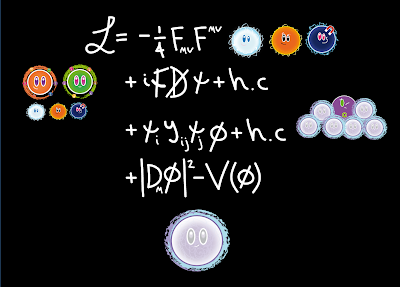 The second line describes how these forces act on fundamental particles of matter, namely the quarks and leptons. The third line describes how these particles obtain their masses from the Higgs boson, and the fourth line enables the Higgs boson to do the job.